As I'm sure you all know, I am the self proclaimed Queen of Afternoon Tea in the North East. I've enjoyed finger sandwiches in posh hotels and slabs of cake in the countryside, but one thing I haven't done is throw my own afternoon tea party at home. I love the idea of enjoying a fancy afternoon tea in my house but being absolutely useless at baking I've always assumed I'd never be able to do it. 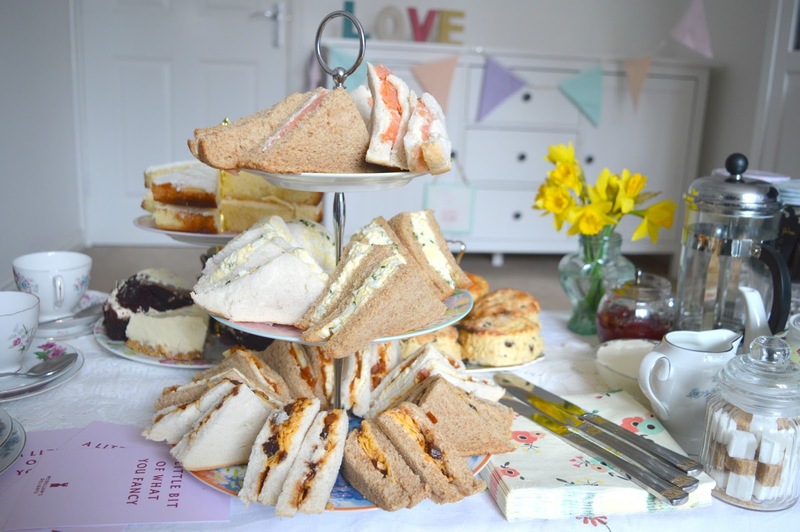 So imagine my excitement when I discovered Mrs Dellow's Delights - a North East based family run company who can deliver afternoon tea to your home. Pinch me now, I must be dreaming? 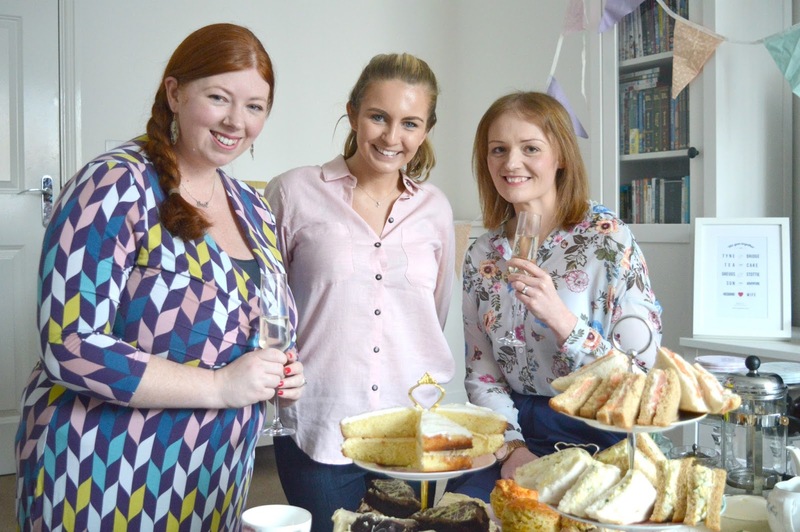 An afternoon tea delivery service based in the North East?! Any excuse to start my birthday a month early, I decided to invite my ladies Katie and Sam over for an early birthday afternoon tea party at home. 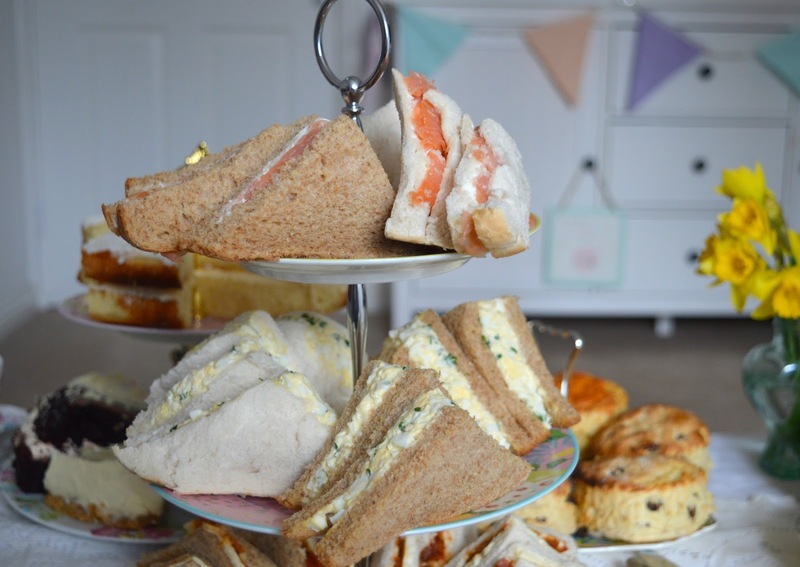 Mrs Dellow's Delights are a great idea for special occasions - baby showers, birthday parties, engagement soirees - their mobile afternoon tea is ideal. They deliver afternoon tea to any location you fancy, set up beautiful vintage crockery for you to use and then when you're done come and take it all away again leaving you with no washing up. In an attempt to be the perfect hostess I decided to set the scene for our afternoon tea by clearing some space in our lounge, making sure I had plenty of comfy seats on hand and hanging up my special wedding bunting that I've been dying to use ever since our big day. 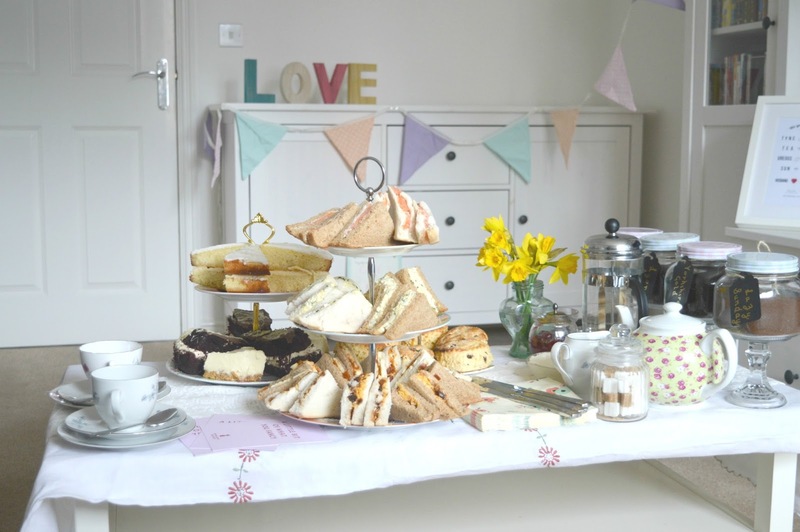 Who needs to head out to a tea room when you have your own pastel coloured bunting? Special mention to my husband who thought it would be funny to change my "LOVE" sign in the background to read "VOLE" - anyone want him? He's free to a good home! After the "Vole incident" Simon was banished upstairs to play on his Xbox, leaving the ladies to settle down to an afternoon of gossip and cake - safe in the knowledge that if we overindulged we'd be able to undo our top buttons without embarrassment. Oh the joys of afternoon tea at home! Mrs Dellow's Delightful Afternoon Tea Delivery Service offers four different afternoon teas to serve every appetite and budget. From the modest Bronze Menu for £9.95 per person to The Bubbly One for £16.50 per person which involves more food and, of course, the all important glass of Prosecco. A list of sandwiches fillings is available before you order meaning that you get to pick exactly what you have as part of your afternoon tea. Mrs Dellow's Delights arrived to set up the afternoon tea bang on time and after a few minutes I couldn't recognise my coffee table as it was transformed into the perfect afternoon tea display. 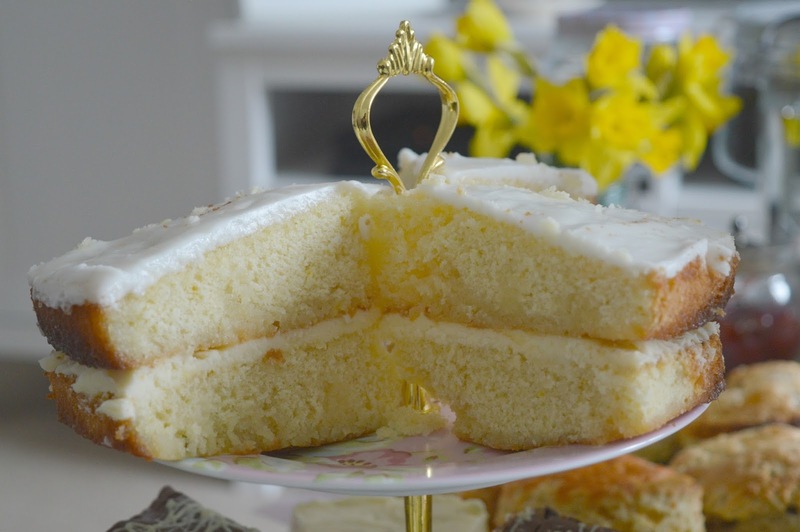 They had thought of everything - beautiful cake stands, mismatch vintage china, a sugar bowl, a little jug of milk and our table was even decorated with a vase of daffodils - such a wonderful added touch. Cozying up with my favourite ladies it didn't take us long to really enjoy the benefits of having an afternoon tea party at home. Free to be as loud as we fancied, stuff as many sandwiches as we could manage without the need for table manners and, my personal favourite, slathering my scone in jam and cream whilst wearing slippers. Our afternoon started with a full on attack of the sandwich tier. No fear for fussy sandwich eaters we'd banished our least favourite fillings which resulted in a delicious feast just for us. Fresh squishy bread overflowing with generous fillings, we had a never ending supply of triangle sandwiches on a mixture of white and wholemeal bread. We worked our way through Wensleydale & Carrot Chutney, Smoked Salmon & Cream Cheese, Egg & Cress and Mature Cheddar with tangy pickle. 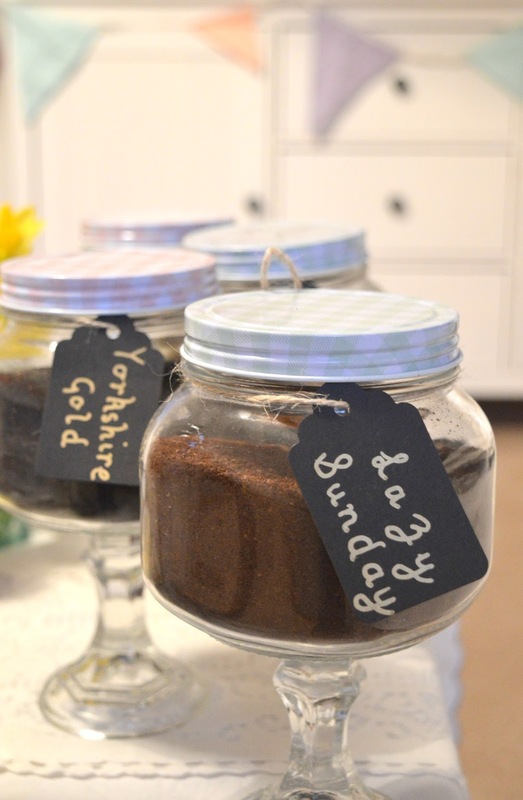 Mrs Dellow's Delights provided us with a selection of tea and coffee for our feast, presented in the cutest jars, all we had to do was keep the kettle full to refresh our cups. Bottomless cups of tea all round! I particularly appreciated the lose leaf Yorkshire Tea, the best afternoon teas are always served with proper tea. We each had a cheese scone and fruit scone and they were huge. I couldn't quite manage both mine (needing to save room for that all important cake) so had half a cheese slathered in butter followed by half a fruit scone that I covered in an embarrassing amount of jam and cream. Why do I always have to be so greedy when I'm presented with the jam and cream? The all important cake tier was something very special. All homemade by Mrs Dellow we were treated to huge slabs of moist Lemon Drizzle Cake filled with an indulgent lemon buttercream, Super Squidgy Chocolate Cake bursting with fresh cream and topped with milk chocolate and (my personal favourite) White Chocolate Cheesecake with fresh raspberries. Some of the best homemade cake I have ever had, each mouthful was heaven. I hate to say it but Mrs Dellow's Delights afternoon tea completely defeated us! Yep, the North East cake eating champion failed! The portions were so generous there was no way we could finish it between the three of us, which meant we all got rather lovely goodie bags to save for the next day. Result! The best part about the afternoon was that after eating all that food all I wanted to do was have a little kip, which I could absolutely do as I didn't have to worry about any clearing up. Mrs Dellow's Delights turned up afterwards to clear the whole lot up and take it all away - they were in and out so fast with so little fuss that when I crashed out on the sofa a few moments later I was left wondering if it had all been a rather amazing dream? I honestly can't recommend Mrs Dellow's Delights mobile afternoon tea enough - it's a brilliant concept, an absolute bargain and the food is delicious! 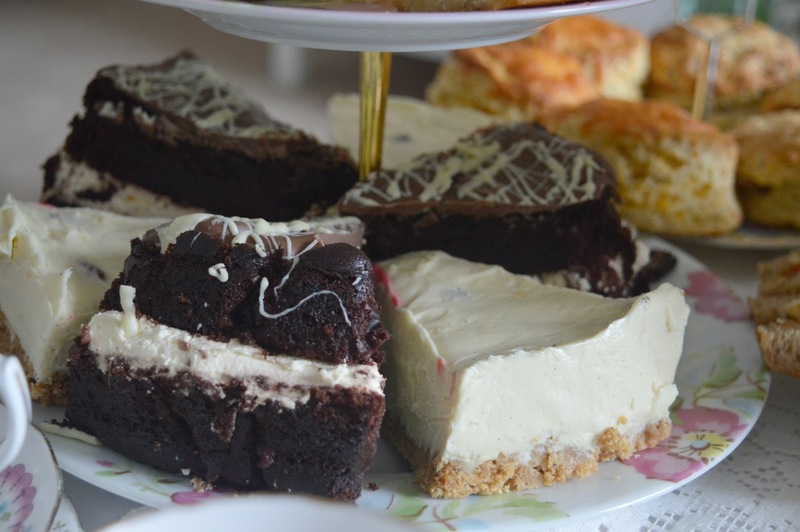 To book your own Mrs Dellow's Delights Afternoon Tea Party give them a call on 07961 825 556 or drop them an e-mail at contact@mrsdellow.com. Mrs Dellow's treated us to a complimentary afternoon tea for review purposes, all opinions are our own - these guys are amazing! This is so cute what a really original idea! That cake looks delicious! WHat a great idea! Everything looks delicious! I had so much fun! I am already thinking of an occasion I can book this for! This just looks incredible and such a lovely idea! I've already told my Mom (a big afternoon tea lover) and she's thinking about booking one! Absolutely love this Chloe! 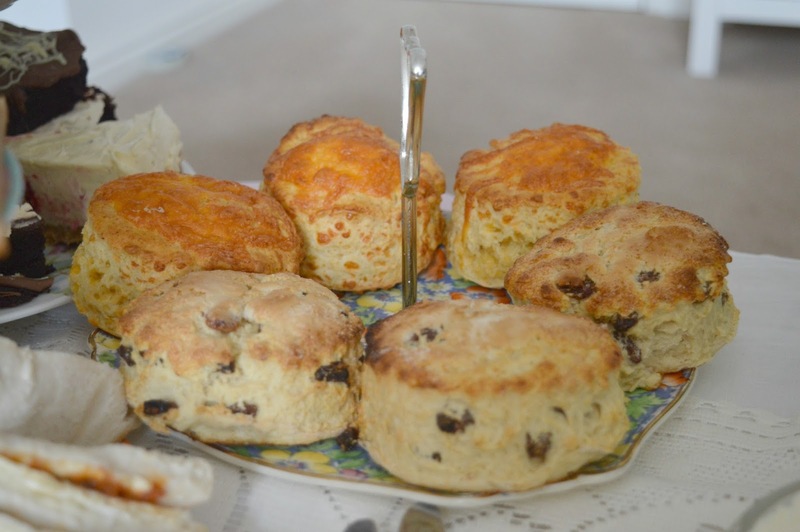 Afternoon Tea in the comfort of your own home. What more could a girl want?